Bike theft is a sad fact of cycling life. Love your bike and want to keep it secure? Cervotec, based in Münster, in the West of Germany, has you covered. Münster is known as a bike town; it has a university and loads of students who cycle, and has excellent cycling infrastructure. Say you have a bike or two and you require a secure infrastructure to avoid theft. Cervotec have models that will accommodate 1-2, 1-4 or even up to 8 bikes. The key differentiator here is that they offer lockable bike garages, and not just run of the mill bike rails to lock your bike. The lockable garages provide excellent protection from the elements and against theft. The company utilizes stainless steel and polycarbonate to create their products – this means that the products are not affected by UV light and do not get brittle with time. Moreover, as shown in the video, there is no effect from hammer attacks. Cervotec offers a standard range of products, built to specific order, and they can make custom sizes upon request. Good for 1-4 bikes. It has a simple hood, which swings upwards, and has its lock in the center from the front. This model houses between 4 and 8 bikes so could be great for an apartment block. It can be up to 3.75 meters wide, and the special security lock for the cover can be on either side. Built for 2-4 bikes. It can have its lock on either the right or the left side, and can be up to 2.10 meters wide. 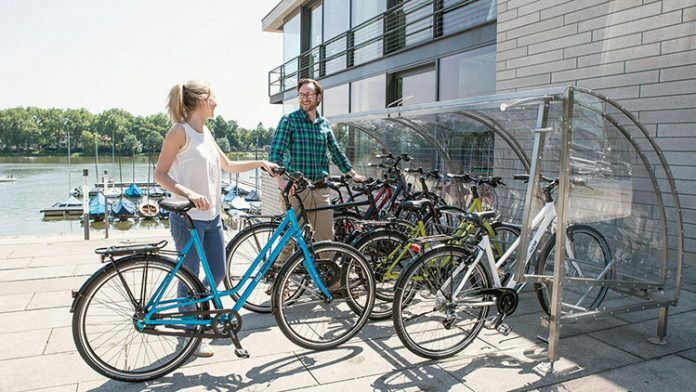 With an increasing number of people wanting better bikes, and the price of bikes escalating as a result, it is reassuring to know that there is a safe and secure way to park your bike.